There’s an intruder among the varnished crustaceans and cat-themed tea-towels in The Shell Shop on Folkestone’s seafront. Admittedly it’s hard to spot, a small sculpture crafted from shiny shells, their smooth ovals suggesting the work of that great seaside modernist Barbara Hepworth. It’s one of a series by the artist Amalia Pica that have been secreted about the coastal town – in businesses and homes, above archways and beneath telegraph wires – offering visitors to its fourth art triennial a kind of late-summer Easter egg hunt. It is exactly the sort of thing I’ve come to expect from the Folkestone triennial: an artwork that sees this faded bucket-and-spade resort of shingle sweeps and crumbling cliff-top hotels with fresh eyes, chewing over its present-day economic status and the role of cutting-edge culture within all that. 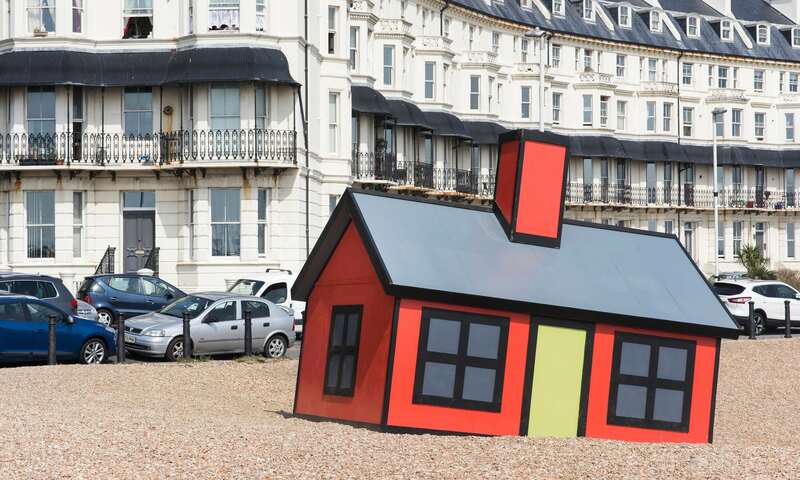 Pica delicately plays on issues around public sculpture and urban redevelopment: the kitsch seaside souvenir joints that are part of the Kentish coast’s lure for the “down from London” crowd, as well as art’s role in its (spotty and not unproblematic) gentrification. This is the awkward, interesting position the triennial readily locates itself in. The funder is local Saga ex-boss Roger De Haan, whose vision for restoring Folkestone includes culture, upmarket eateries and architect-designed beachfront property. While De Haan has drawn criticism for a harbour development whose target market clearly isn’t those living next door in the town’s deprived East End, the triennial is there to make everyone feel positive. This year, for instance, the town gets three of Anthony Gormley’s iron men, which have cropped up in odd places the world over. They loiter in the mossed concrete catacombs beneath the town’s promenades, which fill with seawater at high tide. 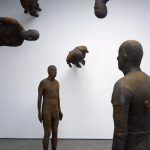 Gormley is one of Britain’s best known living artists thanks to his Angel of the North, and his work has become an easy lightning rod for civic pride. That seems a necessary, laudable impulse in a town where unemployment, empty shops, Ukip and the social tensions of the migrant crisis have taken their toll. At the same time, with Folkestone emerging as a petri dish of Split Britain’s problems, there’s a lot more to talk about. Richard Woods’ wacky bungalows, perched in peculiar plots from a cliff edge to a traffic island, strike squarely at the area’s contradictions. Inspired by a leaflet inviting locals to sell up and make way for the holiday-home market, these loud, bright interlopers are deliberately out of place and suggest, in their own, cartoonish way, not just wealthy second homers but wider anxieties about newcomers. Calais’s refugee camp, after all, was straight across the Channel. Appropriately for a town caught between rich and poor, on the edge of Britain and Europe, curator Lewis Biggs’s 2017 edition of the triennial, entitled Double Edge, claims to tackle “liminal spaces”. Yet often the show itself seems to hover uneasily in an in-between zone. There are lots of sunny, graphic murals slapped across buildings that aim to lift spirits: a Michael Craig-Martin energy-saving bulb in his signature flat, bold colours; Gary Woodley’s sharp monochrome tetrahedra beneath the Coronation Parade; Sinta Tantra’s striped coat of paint for the adult education centre, inspired by a 1947 Folkestone holiday poster, and Sonia Delaunay’s abstract fashion designs. 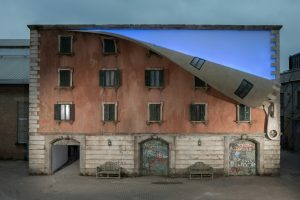 Looking at these works, though, it’s hard not to think of the kind of quirky building wraps encasing new property developments. 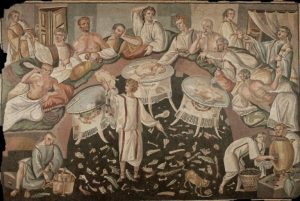 Cheery and head-turning, yes, but when art is reduced to seaside eye candy it demands little more than a surface glance. At the other end of the scale are social projects bent on tackling local issues first hand. 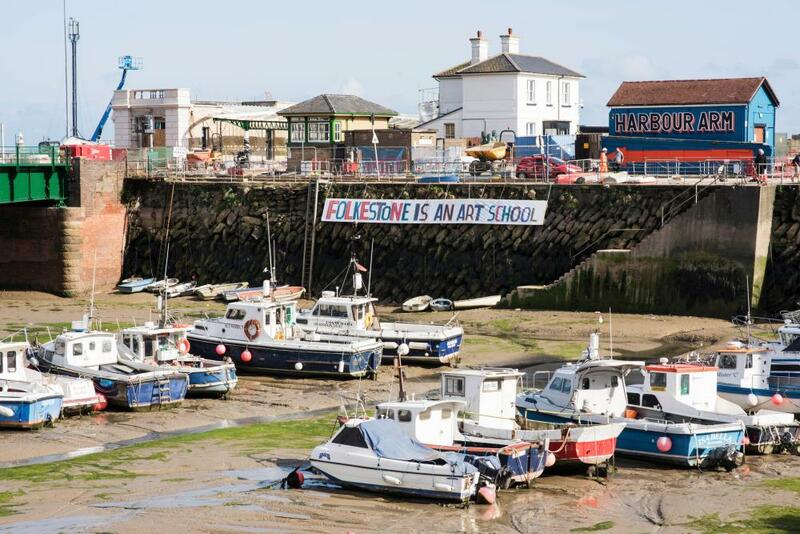 “Folkestone Is an Art School,” declare a series of banners all across town in Bob and Roberta Smith’s trademark wonky, end-of-pier lettering. A man of his word, he has organised classes for young people taught by the town’s resident artists. Folkestone, Smith implies, already has the creative riches it needs. Meanwhile, in the harbour railway – a dramatic ruin when the first triennial opened, now the site of busy redevelopment – Diane Dever has turned the old customs’ house into an urban studies library and venue for talks about Folkestone’s future. It’s what you wish local councils had the resources and inclination for, and while the intentions are impossible to knock, these schemes rarely have the strangeness or risk-taking that makes art tingle. Folkestone’s dramatic landscape and mottled past make it a one-off, and the triennial will always be hardwired to its setting. Yet it’s difficult not to yearn for the odd moment when the show might go off-message with work that puts art before local context, confident that the audience will be game enough to follow. That’s not to say this year doesn’t have its share of unexpected delights, such as in the 18th-century Baptist graveyard where composer Emily Peasgood’s song recordings commemorate its dead. Or Turner prize nominee Lubaina Himid’s pavilion on the shingle in the shape of a vintage jelly mould. With its milkshake pink and white diamond decor a lightly worn reference to sugar and the slave trade, its pleasures are bittersweet. 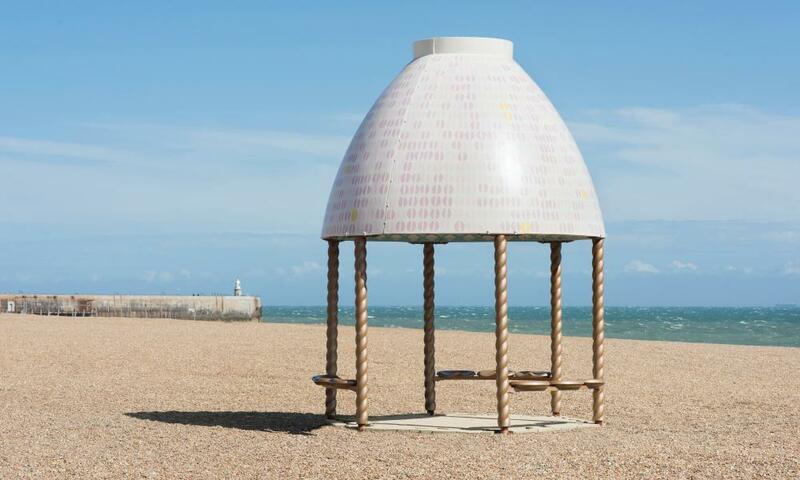 Folkestone triennial runs from 2 September to 5 November. 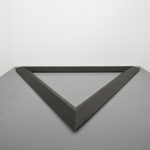 This entry was posted in NEWS and tagged Antony Gormley, Bob and Roberta Smith, British identity and society, culture, Folkestone Triennial, Installation, Local government, Michael Craig-Martin, Poverty, Reviews, Sculpture, Skye Sherwin, Social exclusion. Bookmark the permalink.